Mud, glorious mud: whether making mud pies in the garden or going out jumping up and down in muddy puddles it's the stuff of enduring childhood memories along with climbing, clambering and exploring the great outdoors. But often, today's children are more likely to explore the world through electronic devices and screens. One man wants to change all that. Ben, a former officer in the Rifles Regiment, has created the Bear Trail just outside Cullompton in Devon. It's an army assault course for children (and grown ups) aimed at encouraging young people to work together to challenge themselves and explore their boundaries. There's none of that rubber matting or soft play bumpers here - just good, old fashioned mud. 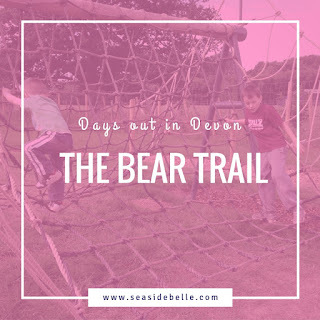 We were invited to try the Bear Trail this week for a Devon Bloggers Meet. As we were midway through the summer holidays, the chance to take the children to something different was just too good to miss. I had expected the trail to be in a forest and was surprised to see all the obstacles in a large, flat field. And actually, it makes it really easy to keep an eye on the children, even if they are going at different speeds and are tackling different apparatus. A large bear statue greets all entrants at the start of the course, which is clearly marked and really easy to follow. The obstacles, which include some pretty high net climbing frames, rope swings, rickety bridges and tunnels, seemed at first glance to be a bit too hard for children. And I was secretly a little bit pleased I didn't have to tackle them as I was holding baby Ossie. However, 8 year old Elliot took them in his stride and 6 year old Beatrix managed to do the majority with no help at all. Wilf, who is 4, was a bit more cautious and avoided the majority the first time round. However, on our second circuit, having watched his brother and sister, he gave them all a go and was soon clambering over the top of a high rope climbing net! Ben from the Bear Trail is firmly positioning the attraction as aimed at adults just as much as children and has plans to host grown up physical training activities for grown ups wanting to get fit. He's even considering opening adult only sessions in the evenings. Certainly, with the increasing popularity of events such as Rock Solid, The Commando Challenge, and Tough Mudder, I'm sure this would be a great way of training. In fact, Ben is full of ideas on how to improve and expand the Bear Trail and is also open to any suggestions. While we were there, the children were encouraged to draw the sort of obstacle they'd like to see added to the trail. Elliot opted for monkey bars over a mud pit. The day we visited was hot, sunny and dry and, although we had been advised to bring a change of clothes and towels, we somehow managed to keep fairly clean and didn't need to use the showers provided. (This was a relief for me as I had been dreading trying to manage all four in a shower block on my own!) However, I'm sure that after a spell of rain, the trail will be a lot messier. We also arrived early in the day and Elliot noted that some of the obstacles, particularly the stepping stones, became a lot slippier and more muddy on his second time round. Ben plans to add more showers as the attraction grows to cater for demand, which I am sure will be high on wetter and muddier days. At the start and finish of the trail is an enclosed children's play area, just opposite the cafe. It's aimed at children under 1 metre and includes a sand pit, roundabout, wooden seesaw and a couple of tyres to clamber on, which makes it a bit more 'real' than the rubber coated parks in towns. The floor is covered in bark chippings, which 16 month Ossie enjoyed exploring (and tasting). And on the subject of taste, the cafe serves a range of hot and cold drinks, sandwiches and cakes, but the highlight for my lot was the pizza, which are served from an outdoor pizza oven. In a world that seems to cocoon children indoors and in front of technology, the Bear Trail is a breath of fresh air. Its back to basics, no nonsense feel harks back to a simpler childhood where you got dirty while you larked around climbing trees and paddling in streams and sometimes you picked up the odd knock and bruise, but you emerged stronger and braver. In the words of a well-known laundry detergent: "Dirt is good". Food: The Bear Cave Cafe serves sandwiches, cakes and hot and cold drinks. There's also an outdoor pizza oven. You are also welcome to bring your own picnics. Getting there: The Bear Trail is much easier to find than we expected; the Bear Trail website warns that satnav might take you to the wrong place. In fact, the attraction is just opposite the Merry Harriers Inn on the B3181 just outside Cullompton. 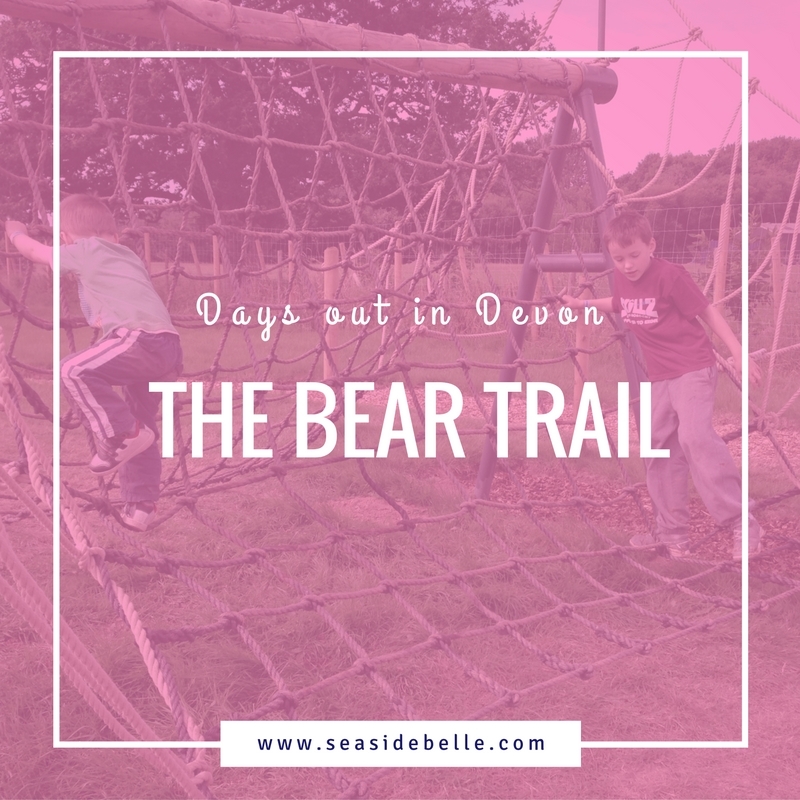 A massive thank-you to the hospitality of the Bear Trail and Chalk & Ward PR for organising the Devon Blogger Meet and letting us try out the attraction.